Hey guys! I've been a very bad blogger lately. I apologize. Moving went smoothly and we settled in in record time-- everything was unpacked and put away withing 3 days after moving in. For the past two months we've been blissfully enjoying living together and preparing to get married. If all goes well, we'll bee getting married shortly after golden week, either the 9th or the 23rd of May. If you're curious about my apartment, I've posted a video tour on my other blog. Unfortunately, I've been pretty busy every since moving. Cleaning an apartment this big and doing two people's worth of laundry and dishes takes more time than looking after just myself and my tiny shoebox apartment did, and my fiance wants me spending my free time with him, not my computer. As a result, I didn't even buy the last few issues of my regular magazines, and they're already out of stores so I can't get the RAWs for you guys. HOWEVER there was absolutely no way I could NOT buy and scan this issue! 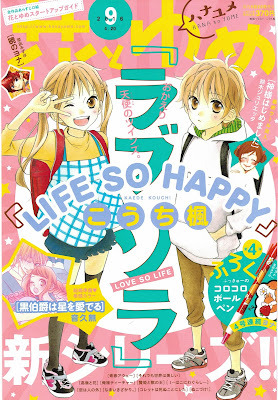 As you can probably guess from the image to the left, Kouchi Kaede, author of Love So Life, has begun a new series called "Life So Happy" revolving around Akane and Aoi's lives as 5th graders. The chapter in this issue of the magazine is a prequel chapter, and the series should be starting from Chapter 1 in the next issue. I will write a brief summary of the chapter below. This chapter is narrated by Akane, who as a 5th grader looks remarkably like a smaller version of Shiharu. Akane and Aoi are still living with their grandparents in Shizuoka, and their father lives with them as well. Kouichi now has a job (what exactly he does for a living is not clear, but it seems he's a regular company employee) that keeps him very busy with lots of overtime and weird hours, so grandma is the main one taking care of the twins. On their first day of the 5th grade, Akane and Aoi are once again in different classes. Akane is sad that her best friend Kanon-chan is also in a different class, however it's some consolation that her new homeroom teacher, Mr. Kawazu (first name Hiroaki) is a total hottie. 5th grade Aoi has a very dry personality (kind of like his Uncle) and when Akane tells him about hottie-sensei he replies that he'd rather have a crusty old teacher who knows how to teach than an attractive young teacher right out of college who doesn't know his head from his @$$. When Akane relates this conversation with Aoi to her grandmother later at home grandma sympathizes with Akane that Aoi doesn't understand a girl's heart. I thought this scene was worth mentioning because it's clear that the twins are starting to become aware of the differences between boys and girls for the first time. It's announced that there will be an "open class day" the following week ('open class day' is when the parents and guardians of students can come to school and stand at the back of the classroom watching the lesson to see how their kids are doing in class and how the teacher's doing teaching them), but because Kouichi has to work, it's decided that grandma will go. There's a short explanation about how Akane and Aoi's mother is deceased and during this scene Akane admits that she doesn't remember anything about her mother and only knows her face from pictures, and that she wants to know more about her but is afraid to ask because it will just make grandma, grandpa and dad upset to think about her. On the way home Akane asks Aoi how his open class was, but he says it was normal, so we can only conclude no one was surprised to see grandma when she went over there to watch. Once they get home, grandma tells Akane that Mr Kawazu is really handsome just like she said (lol) and then she announces that she'll be visiting the school again the following week to see a piece of Akane's artwork that is going to be on display. Akane drew this picture during art class as a 4th grader and it was previously displayed at the community center, where grandma also went to see it, but apparently she wants to go see it after they move it over to the school, too. Akane remembers everyone's reactions to her grandmother during the open class and tries to tell grandma that she doesn't have to come see it again since she already saw it before. Grandma insists it's no problem and that she's looking forward to seeing it again, but Akane gets upset and yells at her that she doesn't need to go see it. When grandma asks if she's done something wrong, Akane runs off crying. thank you very much!! I have been waiting for Hana Yume long time! Congratulation and Have a great marriage! I really appreciate you uploading Hana to Yume, I can only afford one issue per month (having to pay $24 for shipping) and I focus on Skip Beat, so I miss Akatsuki no Yona chapters really often. With your scans I've been able to read some of them so I really thank you :). THank you for your comment Hanako! It really encouraged me. I remember how hard it was to get any Japanese manga when I lived in the US. I'm glad I can help you! Thanks Mi-chan! I am very excited. We won't have a wedding ceremony or anything fancy but I'm still happy to be OFFICIALLY married soon. Wish you in advance a very Happy Married life! Thanks for your hardwork!! ^-^ Congrats..